Bone loss strikes millions of Americans annually. It is blamed for causing as many deaths every year as heart disease! Worse yet, a simple online search for the dangers of biphosphonates reveals the drugs which are prescribed to treat osteoporosis or bone loss – may actually make the problem worse! 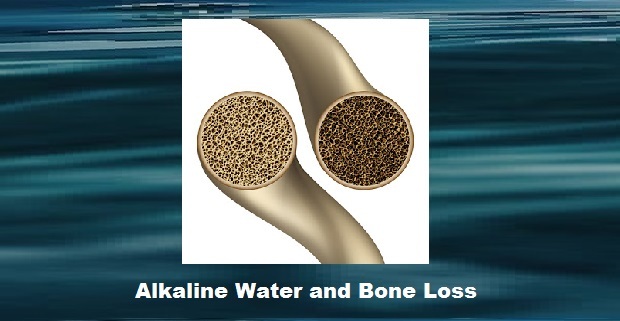 Alkaline water offers a risk-free way to maintain bone health. There are several studies which show that there is a link between drinking alkaline water and maintaining healthy bones. Alkaline water is loaded with beneficial minerals that you need every day for healthy bones like calcium, magnesium, and potassium. In addition, when the dietary minerals in water are ionized they become negatively-charged and therefore highly bio-available. Drinking water with an alkaline pH helps to may help prevent excess acidity from developing in the body’s tissues. Since excess acidity increases bone loss, reducing the body's acidity alleviates that problem. Drinking alkaline water has been shown to reduce the amount of calcium discharged in the urine. Alkaline water is a risk free way for you to achieve better health. With prescription drugs, you have to worry about the side effects, alkaline water has none. In the US, prescription drugs like Boniva are the way people try to maintain their bone health. In Japan, alkaline water is used. America has one of the highest rates of osteoporosis in the world; Japan has one of the lowest. Which method do you think you should trust your bone health with? How does the price of drinking alkaline water compare to the cost of taking prescription drugs? Very favorably. With alkaline water you buy the machine and it’s yours for keeps... no pills you have to keep buying for the rest of your life!